The award-winning, squad-level Lock ’n Load Tactical Series jumps into Western Europe in 1944 with Heroes of Normandy. From the initial D-Day drops, on June 6th, to the fighting in the Norman bocage, and on to Operation Market Garden, this combination of Band of Heroes and its expansion, Swift & Bold, arrives at the battle heavy, with 30 scenarios, over 650 die-cut counters, and the latest v4.1 rules. Command audacious American and British paratroopers and glider troops in daring missions against stalwart defensive positions and fiendish counterattacks by the German Wehrmacht, SS and Fallschirmjägers. Infantry squads and intrepid individuals, such as skilled Leaders and Heroes, are at the core of the LnL Tactical Series. With them you can fire M1919A4, Vickers, MG34 and MG42 machine guns; take aim at approaching tanks with Bazookas, Piats and Panzerfausts; and find the range with heavy mortars and numerous anti-tank guns, from the American 57mm to the dreaded German 88mm. Vehicles, especially tanks, also clatter onto the battlefield to take on pesky infantry and, of course, each other. M4A1 Shermans, M5A1 Stuarts, Fireflies and Cromwells square off against Panzer IIIs and IVs as well as the big cats: Panthers and Tigers. 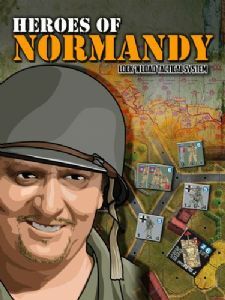 Heroes of Normandy has 30 scenarios and tell the battles of the men from the 101st Airborne, 82nd Airborne, British 6th Airborne, 17th SS Panzergrenadier, 6th Fallschirmjager, 91st Airlanding and 352nd Infantry Divisions. The scenarios covers battles spanning the D-Day drops, fighting the Norman hedgerows and Operation Market Garden. It’s squad-level tactical combat at its most exciting! We Stand Alone – Battles of Easy Company is an expansion module for Lock 'n Load Tactical: Heroes of Normandy. The Lock 'n Load Tactical series is known for its innovative mechanics, dynamic gameplay and ability to bring history to life. Scenarios often play out like a story with cinematic flashes. To that end, The Untold Stories works in concert with the short-story collection of historical fiction of the same name. Characters in the stories are based on named Heroes and Leaders from Heroes of Normandy, and the scenarios are adapted from the stories, for a bold and unique gaming experience. I've waited some while to play a Lock & Load Tactical system game. It was worth the wait. A great package overall; lovely components, nicely presented rules written with clarity and ample examples and 30 scenarios. Rules provide a swift and slick system which nearly captures the feel of the rapid nature of tactical action. As a long term Squad Leader player, this offers the best of that ' world ' but loses much of the clunky parts. Nice chrome too, in the event aspect of the scenarios. All in all highly recommended.